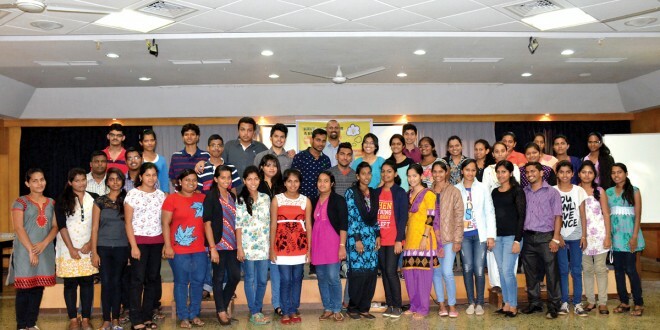 With a view to help youngsters understand the fundamentals of starting their own business; The Navhind Times Planet J’s The Entrepreneur’s Workshop was held on Sunday, February 8 at the Dempo House in Panaji. Over 82 teenagers in the age group of 14 to 20 years participated in the half day workshop conducted by assistant director of GCCI – I Create Goa (GIG), Jervis Pereira. The workshop attracted students from all over the state and distance was no deterent for one of the participant who travelled all the way from Canacona. Students were introduced to business basics and the workshop focused on some key elements like 1) Learning to make introductions and actively listen, 2) Understanding a simple business cycle 3) How to select a business that is right for you 4) Various types of costs and calculation of Gross profit and 5) Various sources of getting funding for your business. Participants were asked to identify their strengths. Based on these strengths participants learnt that their own skills and hobbies could be turned into a business. Youth programs like these help shape not just the future of youth but the state and country at large. “Empowering students today with entrepreneurship as a career is critical due to the impending job shortage,” stated Pereira. The workshop ended with Pereira handing certificates of participation to the students. It was a great experience! It was a burst of energetic information spread out in a creative and very interesting manner. Not like other monotonous workshops. Jervis was like a magician with some interesting tricks which extracted the information from us. His talk was like an icing on the cake throughout the workshop.